I will be away from an internet connection for the next few days so posts may be few, if at all. A break may well do me good in terms of bringing some energy to writing. Talking to a regular reader this lunch time at the end of a retreat at Throssel I was reminded, gently, that it doesn’t always pay to be too available. I think she spoke from experience. Part of continuing writing IS about being available, of being a place which invites people in to connect with themselves. And that’s more or less what the other regular reader I met this lunch time said. Good to see you both. Thanks for your encouragement, much appreciated too. I watched Beasts of the Southern Wild this evening. The child lead is a nominee for the Academy Awards Best Actress. Over in America the awards glitz and prance must be getting going about now. It was her first acting job. Good job! and wonderful ability to scream very loudly. But what would be the effect on that girl should she win the award? Would it be good to get recognition so early in her career. Now 9 years old she would have reached a level of professional recognition many don’t get until they are seasoned. Recognition is a double edged sword isn’t it. Bringing on the one hand confidence (it has that effect on me when, as today, I meet readers) and on the other hand it is easy to get swollen headed and out of balance. Nobody is immune to the lure of fame and fortune. No worries about that for me though! This morning while cooking breakfast I had one of those insight moments. Nothing particularly profound or even new, not new to me anyway. But somehow I saw the whole thing in the round. From birth unto death we are dependent to a greater or lesser extent on being taken care of. We expect to take care of the young, to protect and nurture them. To take care they have their every need met, but probably not all of their demands! Yesterday at the supermarket a young girl with her doll in a buggy were waiting for mother to check through the groceries. A chocolate egg checked through last. Oh!, I said brightly, I wondered if that egg was for dolly as she bent and tucked the egg under the dolls pillow. Mother said, I don’t think that doll’s going to get a look in! There it is, the tension and the early learning around getting what one wants and giving away what you’d rather have yourself! The tension around the reward of taking care of oneself and the reward of taking care of others. This goes on all through life doesn’t it. Almost the story of our lives. Taking care of oneself too often takes a back seat in the face of the seemingly endless needs presenting each day. Gender roles switch and turn about and yes less tightly packaged, thank goodness. It is at the other end of life when things get complicated. So often these days we hear of the elderly wanting to remain living in their own homes, and rightly. Wanting to remain independent for as long as possible. I talk to couples worrying about not wanting to be a burden on their partner but seeing and knowing they will be, eventually. Who will go first? How will she cope when I can no longer take care of myself. Becoming a burden to ones relatives, friends, lover – the state can haunt people from quite early times. I am wondering at what stage in life we take on the mantle of being a burden. For some this comes early, whether or not the need to be taken care of is an actual reality. If I should become dependent on others I hope I’ll accept with good grace. Taking a break from writing this I watched a documentary on Chanel 4, Giles Duley’s Walking Wounded, Return to the Front Line. This film eclipses anything I might say tonight. See also this post on Giles Duley posted here back in September last year. A quote from Thomas Merton. Left by Walter in the comments section and placed here for contemplation. One thing has suddenly hit me – that nothing counts except love and that a solitude that is not simply the wide-openness of love and freedom is nothing. Love and solitude are the one ground of true maturity and freedom. Solitude that is just solitude and nothing else (i.e. excludes everything else but solitude) is worthless. True solitude embraces everything, for it is the fullness of love that rejects nothing and no-one, is open to All in All. (The Journals of Thomas Merton, Volume Six 1966-1967, Harper Collins). In the next paragraph Merton writes, After several days of rain the sky is clearing. Afternoons at the hermitge become once again possible. I walked a bit in the woods…. There is space enough on a chair, a bench or cushion for one solitary person. In generosity. And then we get up and walk out into the sunshine, or rain. Thank you Walter, bows to you for typing out the quote and offering it here. Such a lovely day. Spring is here and a sangha friend and I took the opportunity to go for a walk in the sunshine. 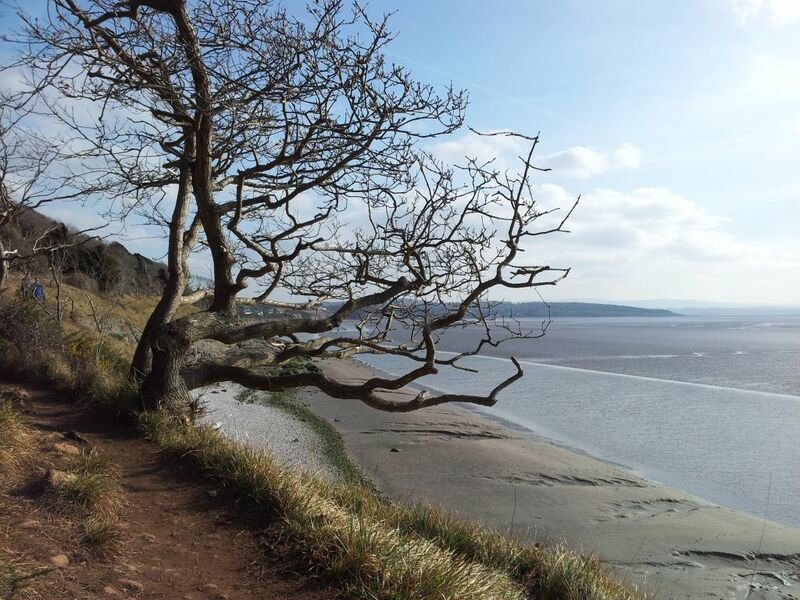 We went on an outing to Arnside Knott. Little did we know at the time that it is a Marilyn a hill at least 150 meters high. Such hills have a rather close connection with the Monroes in Scotland which are mountains more than 914.4 m! Read on….and smile. What is it about us people wanting to climb to the top? Outings are special because they don’t happen every day. Today’s outing was especially memorable. Perhaps because the year has now turned. I can feel that in my bones.